In the early 1980’s, the Quill in Alaska project was a great adventure in learning about stories, writing, computers, classrooms, Alaska village life, bush travel, and much more. Although the temperatures were often -20˚F or below, stories from that time are burned deep in my brain. I learned that stories relate our lives, but that they also shape our lives, and create endless stories to follow. One involved a kind of networking that shows the value of being there, even in our time of electronic communications. As I recall, on a cold, snowy day in March, I had boarded a De Havilland Beaver, similar to the one shown above, to fly from Chevak to Bethel, at the head of Kuskokwim Bay. I may have been the only passenger for that short nonstop flight. Shortly after takeoff, the pilot announced that we’d be making an unscheduled stop to pick up passengers in Scammon Bay, a village on a point jutting out into the Bering Sea. The propellers had scarcely stopped spinning when a young couple boarded. We started talking. I shared some stories about my travels to small villages around Alaska and they told me why they were flying to Bethel. They had just married, and were on their honeymoon to the big city (pop. 3000). I asked them whether they knew of Aylette Jenness. She’s a writer of children’s books, photographer, and anthropologist, and more, a good personal friend. In the 1960’s Aylette had lived in Alaska in their very village for a year and a half. 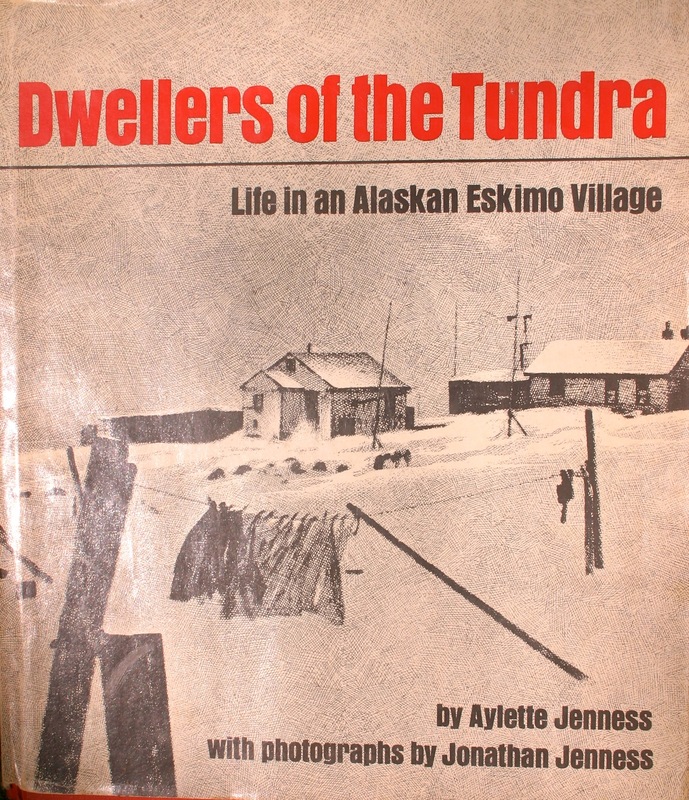 Based on her experiences there, she wrote a wonderful book, Dwellers of the Tundra: Life in an Alaskan Eskimo Village, with beautiful photos by Jonathan Jenness. She soon returned to their village, one generation, and more than 20 years later. 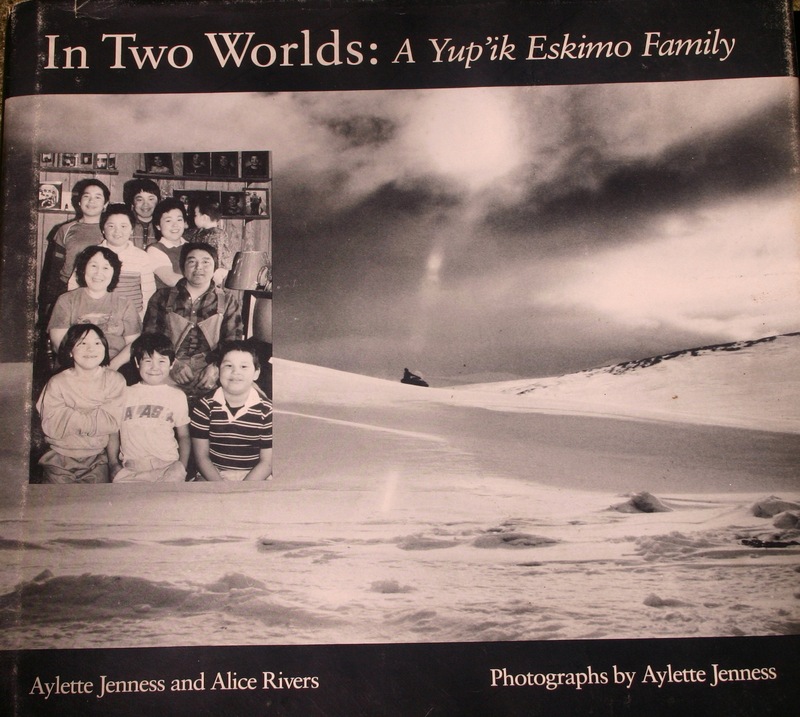 Being the writer and photographer she is, wrote a second book: In Two Worlds: A Yu’pik Eskimo Family (1989). 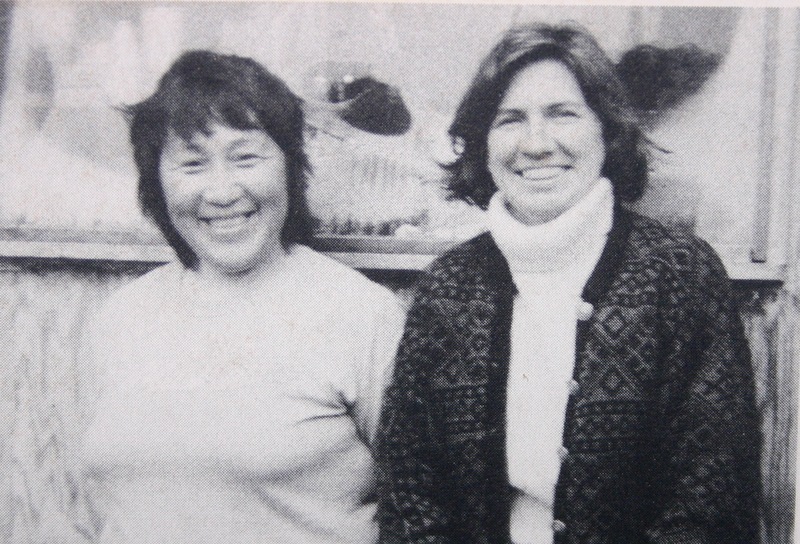 This time, the book was co-authored, with Alice Rivers, a Scammon Bay resident, shown on the left here with Aylette on the right. The change in authorship reflects both changes in the way we write about others and Aylette’s own deepening connection with the people there. The title reflects changes, too. 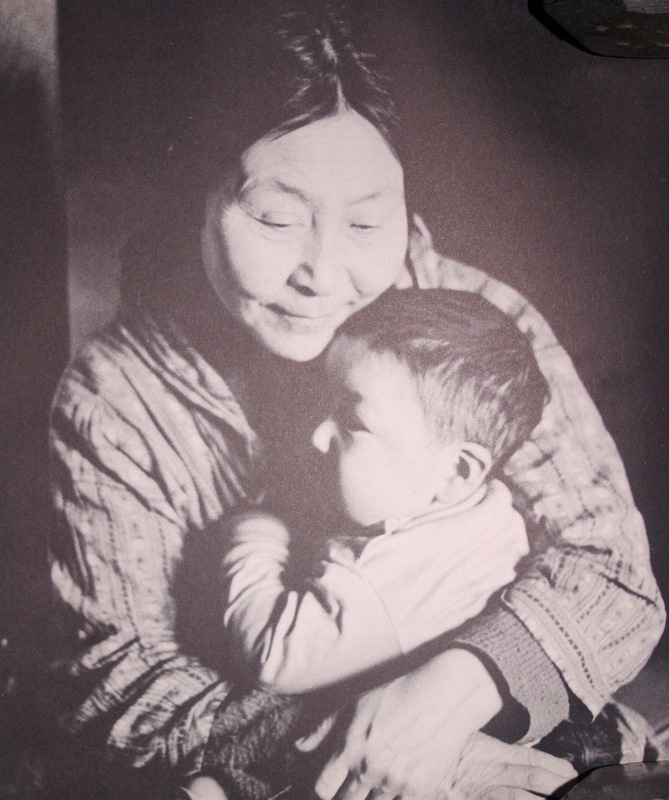 It uses the name Scammon Bay residents themselves use, Yu’pik, not just a broad category, like Eskimo, and everyone is more conscious of living in multiple worlds. The people and Scammon Bay are now identified by name. The books make vivid for me my time in Alaska, even though my stay in Scammon Bay itself was probably just 15 minutes. And the photos are now by Aylette. They’re sharper than in the first book, less dreamy and more reflective of the many facets of life in modern, yet still traditional, Alaskan villages—the two worlds. I don’t think the books are still in print, but you can easily find good quality used copies online. There are times when it’s better to say good-bye. Many years ago, I made several trips to Alaska for the Quill project. I recall it being in November when I first visited Shungnak, along the Kobuk River, about 150 miles north of the Arctic Circle. It was beautiful weather, but cold, with temperatures in the afternoon below 0˚F, dropping to -20˚F or less than that overnight. My hosts Bonnie and Hans were rightly concerned about my citified clothes, especially my ordinary hiking boots. They insisted that I needed Sorel winter boots. With fewer than 200 people, Shungnak had what you might generously call only one small general store, but it was no place to shop for fancy boots, or boots of any kind. Items like that have to wait on the infrequent air deliveries. Amazingly, there was an available pair of boots, just for me. Hans and Bonnie had about 25 sled dogs, who slept outside in that cold climate. Hans would warm up huge pots of food for them. One time, he got a small burn hole in his boot. You can see the small innertube patch in the photo. The boots by then had become a bit worn in other ways, so he purchased a new pair, but kept the old ones around. Fortunately, we both wear size 14, so his boots fit me perfectly. I was very appreciative of them, especially on a long sled dog ride, which is a story for another time. Since I had more villages to visit, Hans graciously gave me his old boots. That bare nugget of a story then started to spread. Somehow, in pre-web Alaska, people would learn within hours all that was happening in the next village 100 miles away. As I traveled, I first found myself being asked whether I was that city guy dressing up to look Alaskan. Then, I dropped out of the story entirely, and I began to hear about “some guy” who wore worn and patched boots, just as if he kept a pack of sled dogs. Unfortunately, I haven’t been back to Alaska for a long time. The boots have been moved from one closet to another. I’ve been thankful for them on cold days with heavy snow, but I never felt that my climate did them justice. I reluctantly decided that it’s time to say good-bye. Maybe I can find some guy who spends his life out on the streets, who has feet as big as mine, and who could make much better use of them. So, this is just a little message to say thanks to Hans and Bonnie, and to the boots that kept me warm and will always be in my memories. Quill was a suite of software tools designed to foster an environment for literacy in classrooms. We wrote it in Pascal for the Apple II computer. The software, teacher’s guide, and workshops were used widely, including in village schools in Alaska, which I visited three times during the project in 1983-84. Carol Barnhardt played a major role in setting up that Alaska project and in helping us understand the history and context of schooling in Alaska. 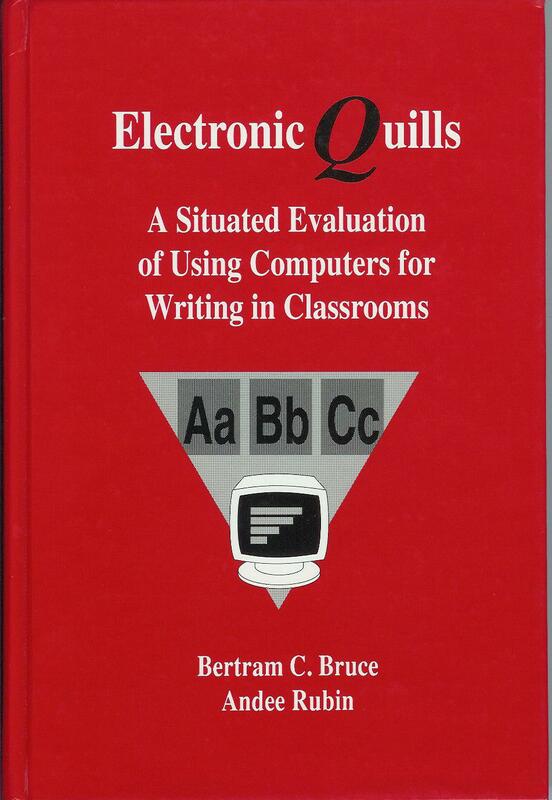 Andee Rubin and I later wrote the book, Electronic Quills, which looks in detail at the stories of early users. 1982-84. The book centers on the words and experiences of teachers and students who used QUILL—a software package developed by the authors to aid in the teaching and learning of writing. It looks in detail at the stories of these early users and considers questions relevant for other teachers, students, researchers, and developers of educational innovations.